Sorry, but there are better ways to do this now. This project has been deprecated and is no longer in development. This page will be kept online for archival purposes and in case anyone is still interested in the project despite being no longer maintained. Sorry, but we have removed the theme generator for the time being as it was requiring too much maintenance time. We will launch a new version eventually, but not any time soon. Visit our example page to test out a range of different styles which you may have in your posts/pages. Or use the preview feature to see your theme without the editing bar in the way. All users have the ability to save their designs, simply choose ‘Save’ in the ‘Upload/Save’ menu and you will be prompted to download an XML file containing all of the data used in your design. If you find any bugs or issues with your design, this file should be linked to in our support forum for our techs to look at. However, we need to make a living somehow and so we have limited the ability to re-upload your designs to our premium membership subscribers. As a premium member, you will be upload your design and edit as many times as you like. Everybody can still make the same designs, but only our premium members will be able to go back and edit theirs at a later date. If you would like to make your design available to others to work from, please post it in our forum. 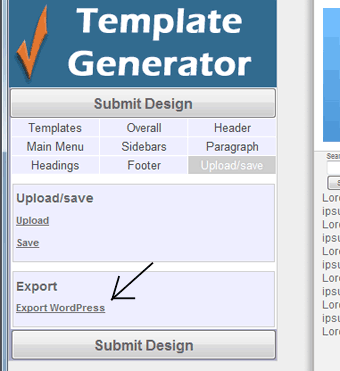 For detailed information please visit the Export to WordPress blog post. There is currently no image uploader built into the template generator; this functionality will be added at a later date. In the mean time, you may link to any URL you like, the template generator will copy the image and place it inside the zip file with your theme. 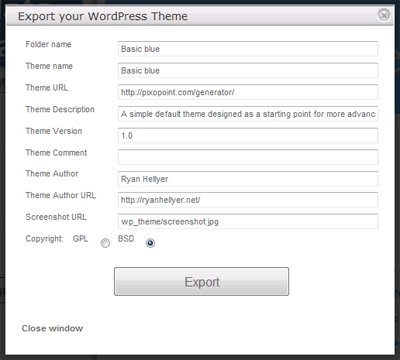 A handy tool to upload images is the WordPress admin panel, simply upload an image, copy the URL and enter it into the template generator. 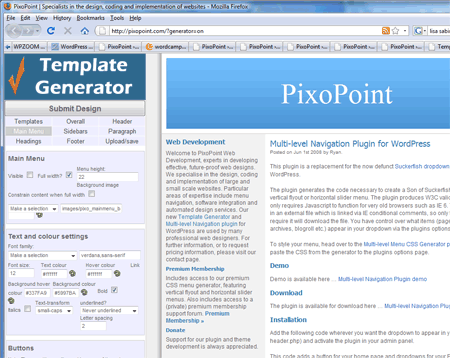 A fleet of changes are intended in future releases of the template generator. 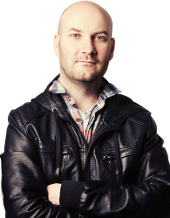 These include integration of a variety of Ajax techniques, direct uploading of images to the template generator and support for other CMS’s as well as WordPress.